Ideas stolen wholesale from here. 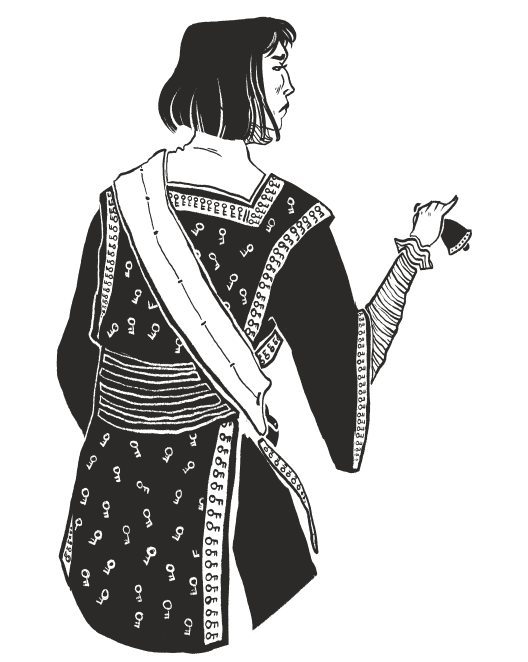 Starting Equipment: The Seven Bells. The Church has chosen you to fight the Embodied Undead. You are most effective against spirits that inhabit dead bodies. Graveyards and catacombs are your battleground; gravedust is your incense and your mark. You carry the most powerful tools the Church can forge against such enemies, but every necromancer in Creation also desires your weapons. You may belong to a small monastic order, or you may be a specially trained priest, or you may be something else entirely. Exorcists are both rare and mysterious. Some people will mistake you for a heretic, a charlatan, or a necromancer. Speak little of your past and conceal your intentions and abilities. You start with 4 Bell Dice (BD), but lose them as you gain templates in this Role. Bell Dice are d6s. Whenever you start using a Bell, or change a Bell's effects, roll all your Bell Dice, plus any extra dice specified by the Bell. Bell Dice always return to your pool. If you roll doubles, roll on the Mishaps table. If you roll triples, roll on the Disasters table. You can use your Bells any number of times per day. You can use one Bell per combat round. If anyone untrained in the bells uses them, they automatically roll on the Disasters table, and the bell's usual effects do not occur. The entire set of bells is worth 1,000gp if sold in a major city, but the authorities of the Church will arrive within 24hrs and start burning and torturing anyone involved. If you die while carrying the bells, your companions should bring them to a pious bishop or abbot. You are encouraged to inform your most trustworthy companions of this requirement. The range listed on the bells assumed clear air above ground. The range can be reduced if muffled by walls or other sounds. Bells affect the closest targets first, but subsequent uses will affect targets further out. They do not affect the Exorcist. You must stop ringing a Bell for 1 round to change effects, or to change Bells. If an effect lists a Save, targets must Save each round the bell is rung. Ancient undead who have faced Exorcists before may gain a bonus to their Saves, at the GM's discretion. You can sense embodied undead up to 50' away, even in total darkness. You can sense the approximate number and strength, either as a smell, a sense of pressure, or with an inexplicable Second Sight. You automatically know the name of any undead of 7 HD or more. If they are truly ancient and notorious, or if they have returned more than once, you may know their deeds, disposition, and weaknesses. The name may not be their true name; it's the name the Church knows them by. At the at the GM's discretion, you can test Religion to learn details. You can use two Bells per round. Roll once, using the largest bell's dice pool + 1 BD. You also lose 1 HP each round you use two Bells. These will be printed on the back of an Exorcist character sheet or given as a handout. Each bell can make a range of musical notes, unlike a conventional handbell. The size of a thimble. High, but soft, like a lullaby's first notes. a) A number of embodied undead up, with total HD = [number of Bell Exorcist templates] x4 or less, must Save or become docile and passive for 1d10 minutes. They will not attack unless attacked. After 10 minutes of ringing Rana, any embodied undead of 1 HD or less are banished. b) A number of living creatures, with total HD = [number of Bell Exorcist templates] x4 or less, must Save or fall asleep. They sleep for 8 hours, and cannot be awoken by anything less vigorous than a slap. The size of a strawberry. Harsh, tinny, flat. a) Cancel the effect of Rana. b) Wake up all sleeping living creatures. c) Draw the soul of someone who recently died back to their body. The soul is allowed a Save, with a +1 bonus for each day since death, and a penalty (GM's discretion) if the death was particularly gruesome, tragic, or unexpected. The corpse cannot move (without the use of Kibeth) or speak (without the use of Dyrim). It is essentially a paralyzed zombie, capable of moving its eyes but nothing else. This effect persists after Mosrael stops ringing. The size of a child's teacup. Many sounds. A merry bell. a) A number of embodied undead, with total HD = [number of Bell Exorcist templates] x4 or less, must Save or move 10' in a direction you chose. You can move them into danger, over cliffs, etc. If you raised them using Mosrael, you can cause them to crudely attack living creatures they encounter. b) A number of number of living creatures, with total HD = [number of Bell Exorcist templates] x4 or less, must Save or move 10' in a direction you chose. If they would move into danger, they get a new Save to resist the effect and stop just before. c) All living creatures with 2 HD or less must Save or move by skipping, hopping, waltzing, etc. They can otherwise move freely, but the unnatural dance imposes a -2 penalty to their Defense. d) All embodied undead gain the ability to walk and move their limbs. This effect persists after Kibeth stops ringing. The size of a pear. Clear, sharp ring. a) All sound is muffled within the range of the bell, except for the Dyrim's sound. Speech must be shouted beyond 10' and cannot be heard beyond 20'. b) A number of noise-making targets = [number of Bell Exorcist templates] are silenced and muted. Unwilling creatures or very noisy targets (bell towers, volcanoes) get a Save. If the target is an embodied undead, it is permanently rendered mute. c) Target embodied undead gains the ability to speak. It does not have to answer your questions, but it may volunteer information, scream, rant, or require the aid of Saraneth to bind. You can typically get 1d6 coherent answers out of any given corpse of a 1 or 2 HD creature. This effect persists after Dyrim stops ringing. The size of a clenched fist. A rattling, leaden bell. The sound is selective, rising and falling differently for each listener. a) All living creatures gain +2 Intelligence, but their thoughts will be morbid and clouded with the cold clarity of death. No romantic poetry, no dangerous schemes, but decent accounting, math, and translation. b) A number of living creatures, with total HD = [number of Bell Exorcist templates] x4, must Save or forget the details of the last 5 minutes. If you Save vs Intelligence, you can select targets for this spell (instead of selecting the closest targets). Each round you ring Belager, you can chose to affect more targets or erase another 5 minutes from targets who failed their previous Save. c) Save vs Intelligence and choose a single target. If you fail, lose 1 HP and take 2 temporary Intelligence damage. If you pass, the target must Save or forget a specific thing or event of your choosing. This can be broad (a child, a crime) or specific (a single poem, a person's face), a but not universal (gravity, the need for food). Very intelligent creatures can Save again if confronted with evidence that they have forgotten something to remember it again. d) Save vs Intelligence and choose a single corporeal undead target. If you fail, lose 1 HP and take 2 temporary Intelligence damage. If you pass, the undead regains full memories of its life, along with its former Wisdom, Intelligence, and Charisma (for the purposes of Saves, etc.). It may despair at its new condition, it may seek power, it may act as a general or a necromancer. Raise nothing you cannot put down. The size of a mug. A deep, low bell. Funereal. a) When you begin ringing Saraneth, chose an amount of HP. Your maximum HP is reduced by that amount. A number of embodied undead (of any HD) equal to that number are bound to your will, and will obey your commands as loyal servants. Powerful undead may Save to negate. This effect persists after you stop ringing Saraneth. If an embodied undead bound in this way is banished or destroyed, you gain the point of maximum HP back (but do not heal any HP). b) Inflict [number of Bell Exorcist templates]xd6 damage to embodied undead, starting with the closest undead. You must banish the closest embodied undead before assigning any damage to the next undead. c) A number of living creatures, with total HD = [number of Bell Exorcist templates] x4, must Save or obey the single-word command you speak when you stop ringing Saraneth. The command must be an immediate and feasible action ("run" and "drop" work, "explode" and "die" probably won't). 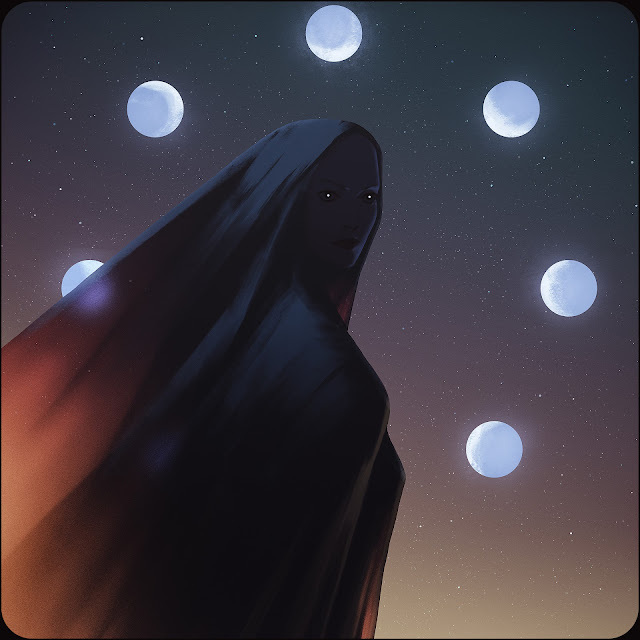 d) A single target must Save or answer your questions, telling only the truth, for [number of Bell Exorcist templates] questions after you stop ringing Saraneth. The size of a skull. So deep it can only be felt, not heard. A bass thump with a cold edge. Adds: N/A. Do not roll if you use this bell. The effect automatically occurs. All undead, embodied or not, are banished. All living creatures capable of blocking their ears must Save or Die. The Exorcist automatically dies (no Save, no tricks). All spells are cancelled, all enchantments broken, all magical effects ended. Creatures that cannot hear gain a +10 bonus to their Save but must still Save. This bell is rarely, if ever, used. It is the final desperate measure, the one tool an Exorcist is trained to use but hopes never to wield. 1. Harsh clap. The Exorcist loses 1 HP. 2. Sour ring. All Saves against the Bell's effect are made with a +4 bonus. 3. Slip. The Exorcist chooses another effect of the same bell. That effect occurs instead. The Exorcist selects the target or targets. 4. Slide. The GM chooses another effect of the same bell. That effect occurs instead. The GM selects the target or targets. 5. Upswing. The Exorcist loses control of the bell for a split second and must Save vs Wisdom or stop ringing. 6. Clatter. The bell's effects do not occur this round. The Exorcists loses 1 HP. 1. Freedom. The Exorcist loses control of the bell. The GM may choose to have a secondary effect of the bell occur, or alter the bell's current effect in an unpleasant way (to target allies instead of enemies, or empower enemies, or raise something the Exorcist intended to banish). The Exorcist stops ringing. 2. Sympathy. A randomly determined (1d6, for bells 1-6) bell rings as well, with a randomly determined effect. Could be the same bell with the same effect. The Exorcist loses 1 HP. 3. Dissonance. The Exorist takes [number of Bell Exorcist templates]xd6 damage and must Save or stop ringing. 4. Overpowering. The Exorcist cannot stop ringing. The bell's effect becomes more serious and disconcerting. After 1d6 rounds, they can Save each round to stop ringing with a +1 bonus per HP they choose to spend. 5. Call to the Dead. All undead, embodied or not, within 1 mile are aware of the Exorcist, their position, and their goals. The Exorcist also loses 1 HP. 6. Rejected. The bell refuses to obey the Exorcist and remains silent. The Exorcist cannot use this bell for 1d6 days. After that, they must Save. If they fail, they can never use the bell again. Rituals of atonement, soul-searching, or desperation can provide a very significant bonus to this Save. The Exorcist also loses 1 HP. Rather than gaining access slowly, like a Wizard, the Bell Exorcist gets all the abilities right from day one. They also get all the corresponding dangers. The goal is to use the bells very, very sparingly until you get all 4 templates up to speed, and even then, to rarely use the most powerful bells. The risks of a catastrophic failure is simply too high. This class is also complicated. To use it effectively, a player needs to be inventive with the use of their abilities, but fully aware of the potential dangers. It's no more complicated than a wizard with 6 detailed spells, but the interaction between them is the main driver of interesting play. Outside of the Bells, this class relies on the Religion skill and their Undead Sense to act as a scout, tracker, and knowledge source for the party. 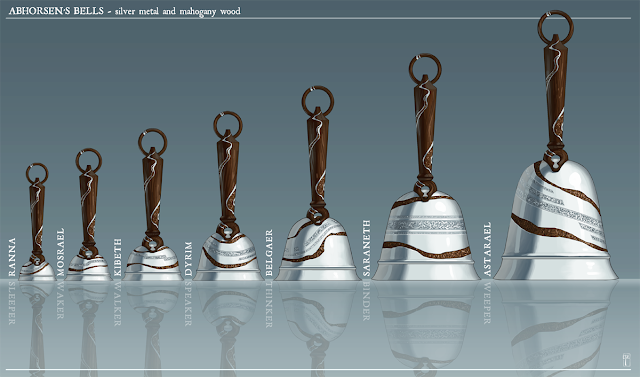 The bells are a huge and diverse toolkit; giving this class more tools seems excessive. You might have noticed that there's no cool background table. I want to leave Exorcists and their place in society in the hands of the player. Rather than defining tropes and categories, I want the player to tell me how they see Exorcists, or this particular Exorcist, in the setting. Multiclassing Monk/Bell Exorcist could work well; this class is potentially quite powerful, but also quite unstable with just one Bell Exorcist template. I'm not sure how a multiclassed Bell Exorcist/Necromancer would look yet because I haven't finished my version of the Necromancer wizard school. I suspect it would be... worrying. I hope I can have a crib sheet. Aside from Nix, surely the other apt reference is The Nine Tailors. Oh of course, just like wizards get a spell crib sheet, you'd get a bell crib sheet. And I didn't even remember reading the Nine Tailors until you mentioned it, but skimming the summary, I'm sure I did, many years ago. The Nine Tailors is an old favourite and set quite close to my neck of the woods. "I went all cold and sweaty and the torch dropped out of my hand and went down, and hit one of the bells. I'll never forget the noise it made. It wasn't loud, but kind of terribly sweet and threatening and it went humming on and on, and a whole lot of other notes seemed to come out of it, high up and clear and close - right in my ears. You'll think I'm loony, but I tell you that bell was alive." "You wait till you get stuck on a ladder in a belfry in the dark. Bells are like cats and mirrors—they’re always queer, and it doesn’t do to think too much about them." Incidentally, I'd never made the bell, book and candle/Abhorsen connection consciously before - many thanks for that! How often do you expect this to come up that you need three subclasses? Do you intend to have a supernatural-focused campaign? Or is it for historical completeness? Sure, you could run a game with all members of the 1st Estate, but there's another reason. They are fun to write and really easy using the GLOG. I wrote up 10 kinds of wizard and, in ~18 sessions total, I've run all but 2 of them. High mortality games are interesting. This stuff just provides more diversity and things to try out. The Bell Exorcist is definitely not a "core" class; it's an extra-special treat for someone who really likes reference sheets. I've seen the notation "Save vs Stat" a lot on your blog. I'm familiar with the Glog system, but don't really understand what this means. It's just "Roll under the appropriate Stat". I switched to that format because my players (all noobs) were getting confused with Saves and Checks and Rolls. "Save vs. Stat" is "roll under the selected Stat", "Save or X" is "roll under your generic Save value". Bonuses apply, etc. I've wanted this class for so very long. Thank you for making it. Very nice. Really enjoying the blog. Exorcists of the bell probably wouldn't live very long. Triples indicate a 1 in 36 chance of killing yourself. 3. Up to 4d6 HP (which could potentially kill you but it's not certain). If you're looking at 2. Sympathy and thinking it could cause Astarael to ring, remember it's bells 1-6, and there are 7 bells. This is probably the best take on a cleric I've ever seen. Maybe it's partly the names, but each bell seems really intense and intriguing, just like a dark magical item should. And here I was starting to think my games wouldn't even need magic classes!